If you’re still sad about Audi’s Le Mans prototype effort going the way of the dodo, Audi has a mild consolation prize. It’s an R8 in Audi Sport racing colors, just like the R8s, R10s and others that you dearly miss seeing compete. Now you can live like Dieselgate never happened, and never forced any major cuts to Audi’s racing programs. Last year was Audi’s most successful year ever in customer racing, where the R8 LMS GT3 took home 24 championship titles and 85 race victories—and that’s on top of years of successful factory teams. So, it’s about time Audi commemorated all of Audi Sport’s racing efforts with a limited-edition car. 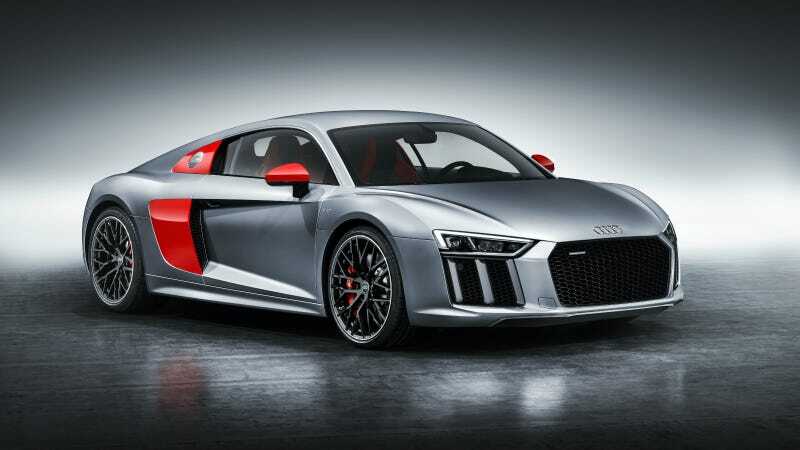 Only 200 Audi Sport Edition R8 Coupés will be made. While there are several shades of silver, black and white to choose from for the main exterior color, the sideblades and exterior mirrors will be red. There’s more red accents inside too. Not a huge addition to the R8, but it works. I’m extremely partial to the color combo Audi chose for their press photos, though: a pretty silver that makes the special-edition R8 look like it’s adapted from the livery in Truth in 24. It’s practically made for hopping inside and pretending to be Allan McNish. You’ll be yelling at traffic in a Scottish accent in no time. Just you wait. Now excuse me while I sob quietly in the corner as I wonder why the one true four-ringed prophet Jason Statham has abandoned us all, as Audi now has to tout customer racing stats when justifying a new racing-inspired R8 trim. The factory racing teams never did any harm! They were innocent! Transporter! Come back! The R18 Never Cheated On Emissions Tests! Innocent!